Today was a perfect day to work on a Christmas card. Its been raining here in southcentral Alaska and I feel like the most wonderful time of the year is just around the corner! Autumn arrives quickly in Alaska and winter isnt far behind...I've already got leaves falling from the trees and the Talkeetna and Chugach Mtns that surround us have already had some snow. I cant wait until we get our first snowfall here in the Valley! 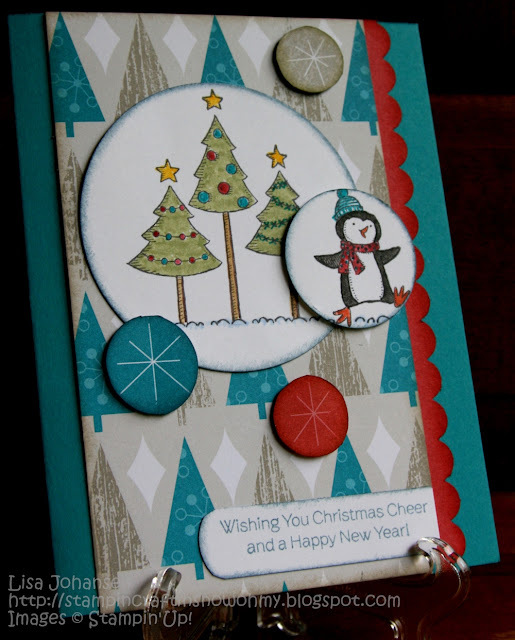 This week Jingle Belles is joining up with the Clean and Simple Stamping blog for the challenge, which is a sketch. 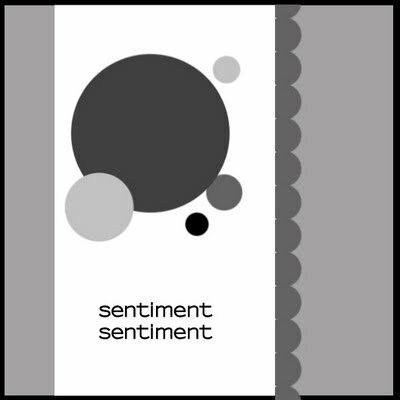 I love CAS cards but I have to admit when I saw the circles on the sketch I groaned. Just not my style! I sat and thought about it for a bit and decided to use my Polar Party set(LOVE the images!) and some of my favorite DSP(which I also noticed a designer for FTL used...oops. Great minds think alike eh?). The DSP background makes the card seem a little busier than it really is but overall I think I did pretty good with the CAS part. I have to say I really like this card and how it came out...I might make a few more of it! I love this card--the colors are gorgeous! One of my favorite combos is turquoise/teal and red. Love the inked edges as well. 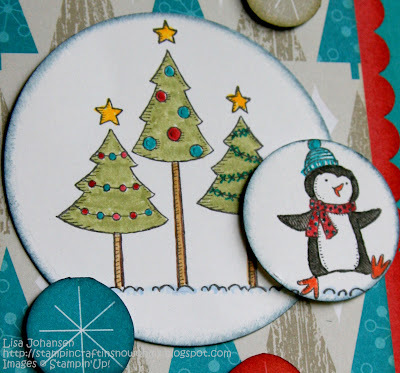 I adore that paper & color combination ... and that sweet little penguin is just too fun ... so glad you joined our CAS creating at jingle belles. Oh my word Lisa...this is awesome! I love the colours and the colouring. That DSP works so well too! This is fabulous Lisa ... a difficult sketch for CAS ... I need to have a think! Love your card... but what I love evenmore is the blog's header!! Such a cute moose! I'm a moose lover so that really was the best surprise! Lisa, this is A-Mazing!!!! You knocked this out of the park! Fabulous colors, the circles turned out perfect, and the images are the cutest. Love the card. Thank you for stopping by my blog. I love it! Just great! the stamped images are just adorable and the overall look of the card is just gorgeous! Oh you really have rocked this challenge! I just love the modern, graphic feeling to the papers and the cute trees and penguin - just lovely!! Here's mine! We've got falling leaves too - but winter is a long way away here!! The colors you have chosen turquoise blue, oatmeal mixed with traditional green and red is very festive. There something so special when the first snowfall of winter falls, I remember it when I loved in Colorado. What a great design for the sketch. Your paper choice and the images are just perfect. I love penguins! Enjoy the leaves falling. We are all green here in upstate New York, but the air is just a bit different than a few weeks ago. It will be here before we know it. Lisa, I love your card! Great non-traditional colors, warm, and fun! oh, and I can see why you chose this one as your favourite! it's gorgeous!